A fedora and trenchcoat, a beguiling femme fatale, a city in the throes of corruption. All elements of the film noir genre and all present in the picture The Tooth and the Nail. Adapted from a crime novel by Bill Ballinger, an author criminally unknown by mass audiences now but whose work from the early 50s till the late 70s had a marked influence on TV and the crime mystery genre. The Tooth and the Nail is pure period pulp. Helmed by one of the directors of the equally stylish period horror film Epitaph, Jung Sik later quit during post-production due to creative differences with the production company and was replaced by Kim Hwi, whose credits include a list of horror and suspense-thrillers (The Neighbors, The Chosen: Forbidden Cave). 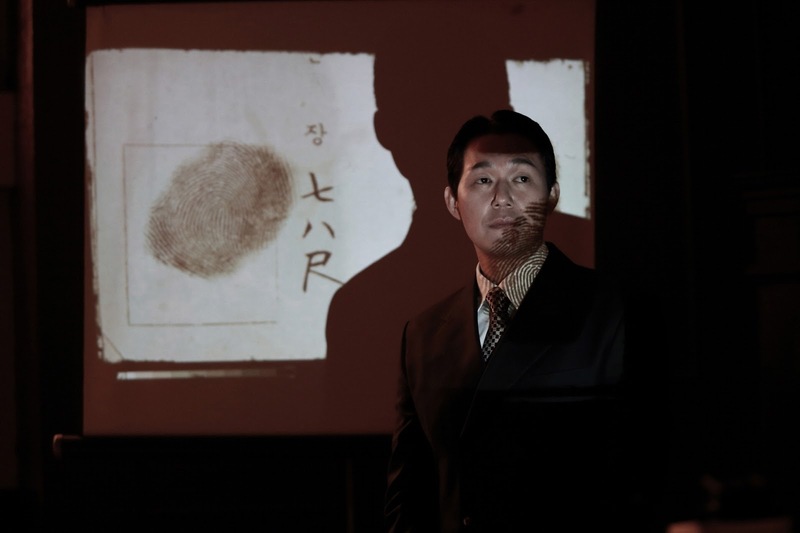 Set during the early days of Korea’s liberation from Japan, the story ostensibly begins as a murder mystery as insouciant businessman Nam Do-jin (Kim Ju-hyeok) is on trial for murder. 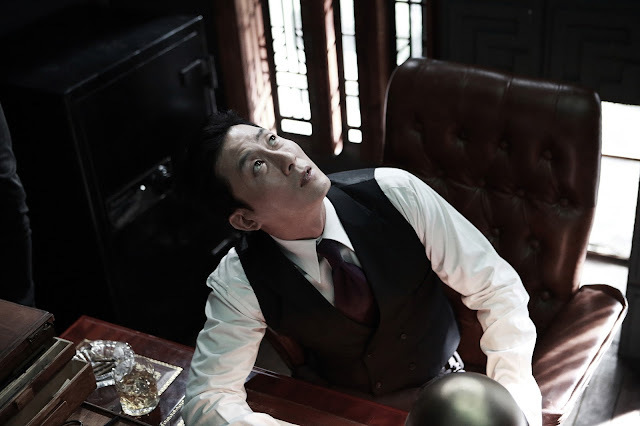 Inlaid between the court case the film flashes back first to a romantic b-story between a charming magician named Choi Seung-man (Ko Soo) and a mysterious woman, Jung Ha-yeon (Lim Hwa-young). As the story unfolds the introduction of the film’s macguffin, a set of copper plates used for counterfeiting, leads us to the death of the pretty lead, and the predictable switch towards a revenge narrative. With serpentine plots like The Tooth and the Nail it’s easy to get lost and divested in the mystery especially if it’s either too easy to solve or the plot strains credulity. 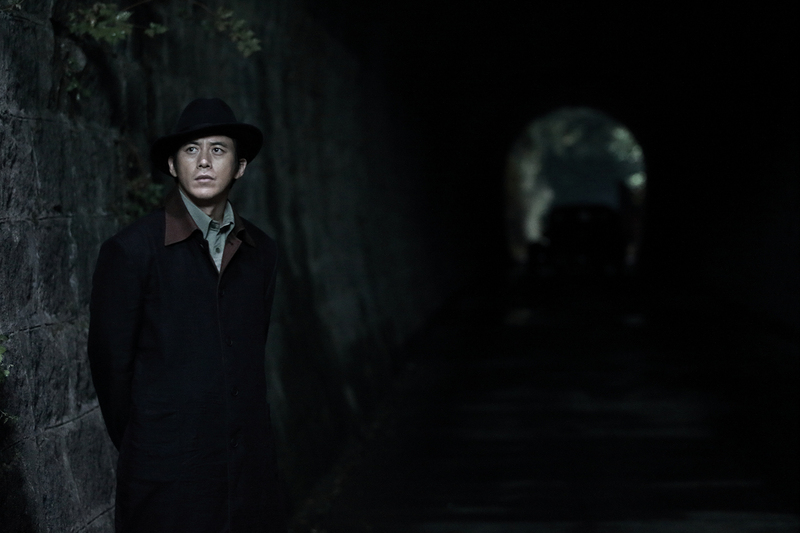 And, Jung and his co-writer, Lee Jung-ho, should be commended for the film’s first half, as story and exposition is carefully doled out and leaves us asking for more, but by the time the revenge narrative kicks in the moody atmospherics make way for a by-the-numbers whodunit, or more exactly a howdunit. This shift in tone and quality, a possible byproduct of the film’s dual parentage, is a real shame. With the reveal of the film’s antagonist so early on in the second act, the tension that the story builds up to with the use of flashbacks to Choi’s revenge quest and flash forwards to the trial itself are drained of suspense by the early reveal. With the knowledge of who the figure in the shadows is and that he is alive, the film’s opening scene is made devoid of any mystery, and the interwoven tales fall apart into a series of tired cliches. Aside from the picture’s half-hearted second half, Yoon Jong-ho’s camerawork is well done and his shot compositions are a mix of narrative economy and cinematic poetry. The use of a cool blue tint and a golden yellow during the scenes charting Choi’s romance with Jung or the way black is used to signify the villain and Choi’s change of wardrobe to black is a clever way to illustrate mood and propel the story along. And it’s evidence of a real visual acuity that the film goes from bright airy colors to solid dense colors as the veneer of the happy love story turns tragic. Even the light in the latter half of the film goes from bright yellow or white to being tainted with a sickly copper color. Yet, with this all said The Tooth and the Nail does suffer from bad CGI graphics; specifically in the opening scene set at Nam’s mansion right after the supposed murder. What should be a scene of chiaroscuro lighting and minimal effects is rendered as a cheap horror scene; the mansion looks like Dracula’s castle, complete with rain effects and thunder and lightning cues, with Nam’s reveal looking more like something out of a videogame as the set turns into a computer generated counterfeit image as the exaggerated color palette, unrealistic camera angles and boring compositions detract from the unmanipulated but far superior shots in the film. CGI’s abuse in current Korean fare, I think, can be summed up in the fact that it is utilized to create a perfect image; e.g. perfect lighting, perfectly shot actors, perfect scenery; but that is counterintuitive. First of all, CGI exists for filmmakers to render the impossible into something tangible. By wasting CGI on trying to perfect the banal or mundane it does not make the real more real; the image is just stranded somewhere deep in the uncanny valley. Also, this search for the perfect prevents those accidents in cinema that often inspire something far greater than what was originally imagined. The Tooth and the Nail continues the Korean film industry’s current obsession with mining the country’s post-Colonial past. It’s appropriation of the film noir vernacular is successful for a good part of the movie’s run time, but the clever reveals in the first half do not hold the film up to repeat viewings. The Tooth and the Nail is a mere counterfeit, exhibiting all the tropes of a familiar genre, but lacking the intangible poetry that elevated cheap pulp into cinematic gold.